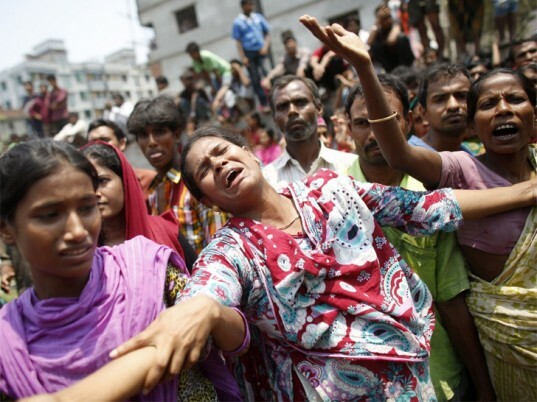 As thousands of Bangladeshis swarmed the streets of Dhaka to express their anguish on Friday, setting fire to vehicles and wrestling with police, the death toll in the Rana Plaza building collapse broke the 300 mark. Army spokesman Shahinur Islam told Reuters that the death toll had reached 304, while and H. T. Imam, an adviser to the prime minister, said it could surpass 350. “Our prime target is to rescue the rest of the survivors alive, as we are running against time,” a military spokesman told reporters more than two days after the incident. Still, amid the death and destruction, a sliver of hope: Rescuers were still pulling people alive from the debris—72 since daybreak and another 41 overnight—including two women who gave birth under the rubble. But fears remain that hundreds of people are still trapped in the wreckage of concrete and steel—once an eight-story facility that housed a bank, a shopping mall, and offices, and five garment factories that employed some 2,500 workers—in the commercial suburb of Savar. The collapse occurred Wednesday morning, a day after cracks appeared in the structure and the building managers were warned not to allow workers inside. Shops and a bank branch on the lower floors were immediately closed, but the owners of the garment factories on the upper floors told employees to return to work on Wednesday morning or they wouldn’t be paid. A spokesman for Prime Minister Sheikh Hasina said she had ordered the arrest of the owners of the building. An industry official has said that 3,122 people, most of them female garment workers between the ages of 18 and 20, were in the Rana Plaza building when it imploded. Around 2,350 people have been rescued, with half of them injured or in critical condition. A spokesman for Prime Minister Sheikh Hasina said she had ordered the arrest of the owners of the building and of the five factories that occupied it. Dhaka District police chief Habibur Rahman identified the owner of the Rana Plaza building as Mohammed Sohel Rana, a leader of the Bangaldesh Awami League’s youth front. But Rana has “vanished into thin air,” according to Imam, the prime minister’s adviser. “People are asking for his head, which is quite natural. This time we are not going to spare anybody,” Imam said. Demonstrators on Friday carried black flags, some starting fires and others using clubs to break the windshields of passing trucks. Hundreds of workers mobbed the head office of the Bangladesh Garments Manufacturers and Exporters Association at Karwan Bazar in Dhaka, demanding the arrest of the factory owners and calling for the death penalty for Rana. The disaster is only the latest in a string of industrial accidents that plagues Bangaldesh’s garment industry, which employs more than 4 million people, most of them women. 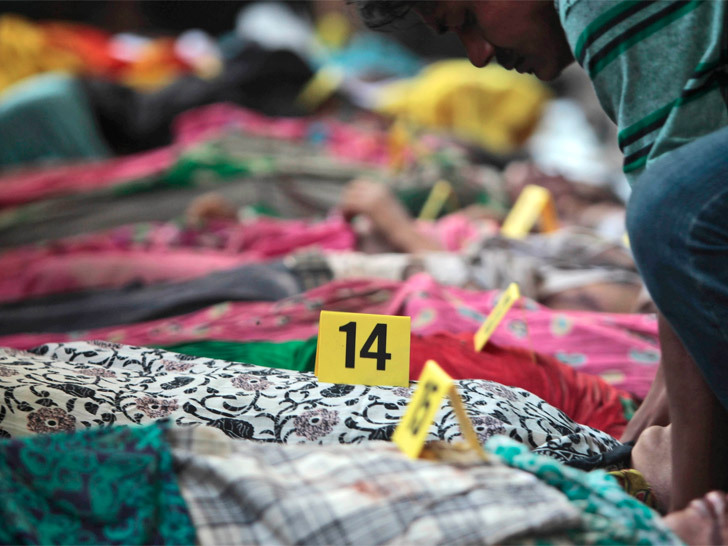 The Rana Plaza incident occurred only five months after a fire at the Tazreen Fashions factory killed at least 112 garment workers in the worst industrial disaster the country had ever seen. While the U.S. State Department said Thursday it wasn’t able to provide details about whether American companies were connected to operations in the collapsed building, labor activists who entered the site have found invoices, cutting orders, and labels linking several major U.S. and European retailers to the firms that occupied the plaza. The disaster is only the latest in a string of industrial accidents that plagues Bangaldesh’s garment industry. British retailer Primark, which has 257 stores across Europe, confirmed that one of its suppliers occupied the second floor of the building, adding it was “shocked and deeply saddened by the appalling incident” and will be working with other retailers to review the South Asian country’s approach to factory standards. Other textile businesses in the building, according to documents obtained by reporters, included Phantom Apparel, New Wave Style, New Wave Bottoms, and New Wave Brothers, which produce clothing for U.S. and European brands such as The Children’s Place, Cato, Dress Barn, Spain’s Mango, and Italy’s Benetton. A Benetton spokesman denied that any of the factories were suppliers to the company, however, while Mango claimed it had only an unfulfilled sample order with Phantom Apparel at the plaza. Ether Tex, another of the factories in the building, named on its website Walmart, the world’s largest retailer, as one of its customers. Walmart released a statement to say it’s currently investigating the situation. On Friday, labor groups also distributed photos of garments with labels from JCPenney and Spanish retailer El Corte Inglés, from the site of the collapse.